I'll bet they'll be Ok, birds seem to be able to build nests about anywhere. To my annoyance birds built nests above my back door on the porch and above the car. They'd squawk and fly off every time we went out the door....which was a lot! But the birdies are all fine. Killdeer are known for making bad nesting choices here, where they seem to prefer gravel roads and lanes. They also use the strategy of being noisy, behaving as though they were injured, and running in front of predators to draw them away from the nest. Unfortunately, those strategies don't work well when cars and trucks are involved. Good pictures. I agree, maybe she isnt the smartest bird alive, but she is protective about her soon to be babies. Aw shoot. She probably did this on the weekend when there was nothing going on at the school. She is just a few weeks early, as the school will probably be very quiet soon. Poor bird. I once saw a mother duck lead all of her babies into heavy traffic. It was a death march and horrible to witness. Sometimes, mother does not know best. Yep, that's a killdeer. They are ground/gravel nesters, and I suspect it will be ok with the eggs, provided a snake or rat doesn't find the nest. 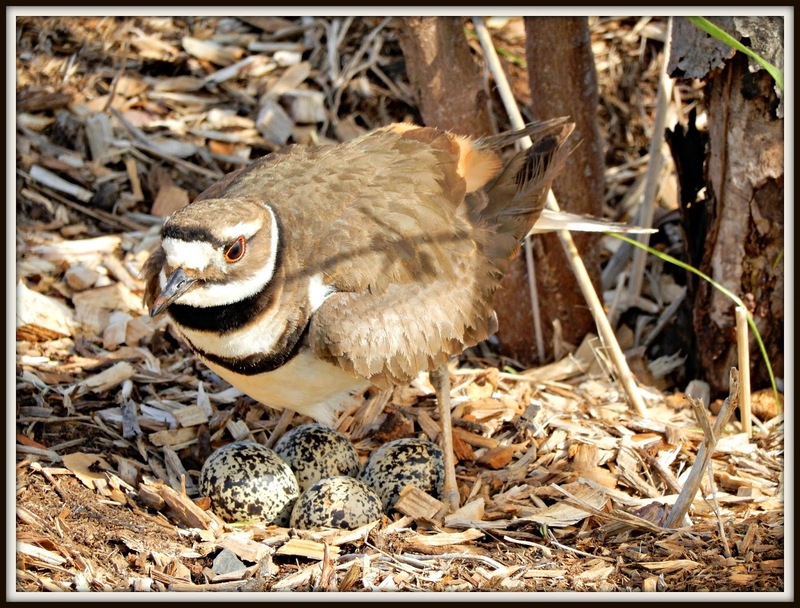 killdeer lay eggs in a scrape on the ground. and in some very odd places. amazing they manage to survive. I hope the eggs make it and glad the school is teaching the kids to be kind. A lot of times the mother acts wounded and walks away from the area to distract a predator. Yes, yea for the school teaching the kids to be kind. I've always said that about Killdeer too! 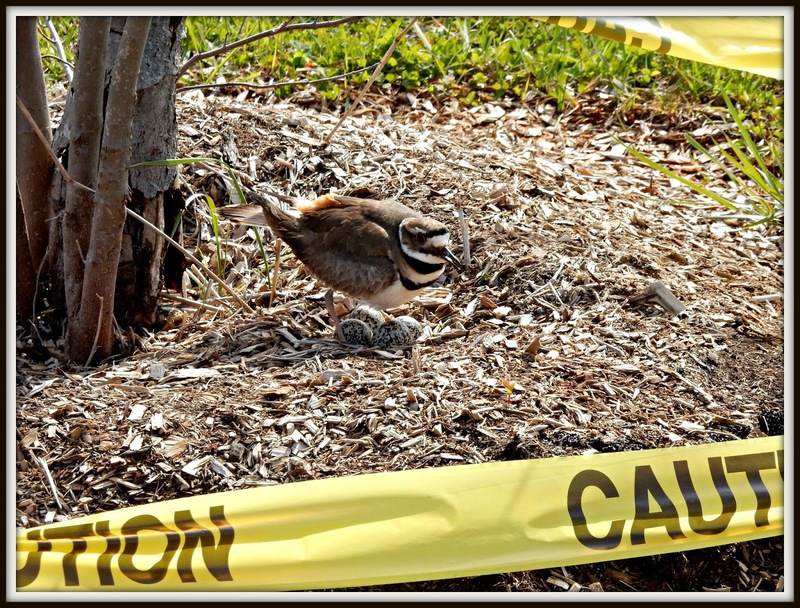 We moved into our house in 1989, and we used to have lots of Killdeer and many stupid locations for their nests. Some just in a bare spot in the middle of our yard in the complete open. Really? So I'd mow around it! But all the silly places has played a toll, we don't have any more Killdeers around, and it's sad. I just adored hearing them and seeing them visit. Poor little lady. Hope she stays safe and is able to take care of her little ones. Yes, I recognized her as a Killdeer right away. We have a few around here. Good grief! Well, since it is at the school, hopefully you can keep an eye on her and give us a report each time you see her. The school is awesome for doing this! That is wonderful that the school is protecting her and her eggs and making the students aware. What a beautiful lesson for them! That was a good idea, the tape, with so much fuss around. Oh we hope they are all okay! Oh dear, i hope everything turns out okay! Normally birds take the best of care to lay eggs, but this would have been some mishap for sure. Right now i have an Indian Myenah and a pigeon lay eggs in a small home they have made in each of my bathroom exhaust fans outlet ( it is common here in India ). 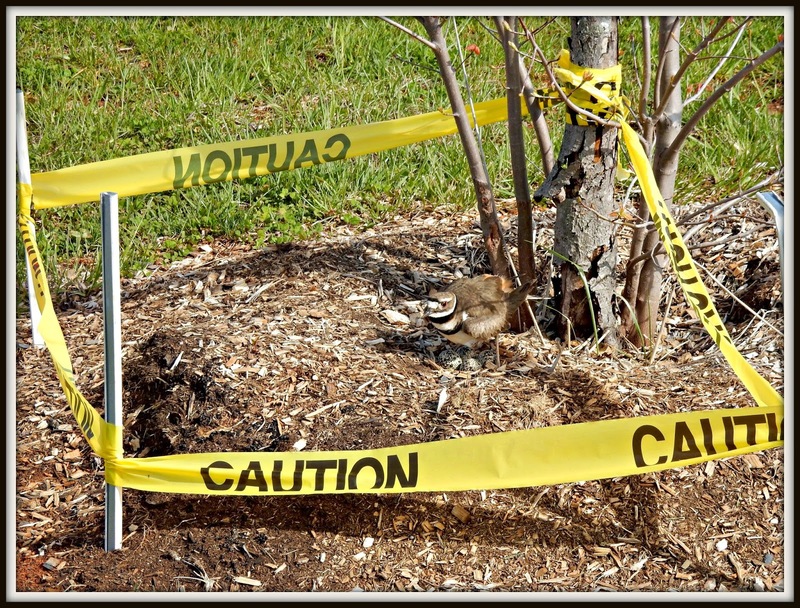 I appreciate the fact that, at least, a caution sign is put across to mark the safety of the bird, eggs and humans. Wonderful that the school was trying to help this little mama out! Great pics! I hope she hangs in there! She is a pretty bird and has some very pretty eggs, but she it does appear that her elevator stops at the first floor! I wish I had a camera as good as yours, and skills as good as yours. The pictures are excellent. That's funny that she laid them there. Poor Momma Bird! Aw! It may have seemed like a good idea at the time. It does seem like a strange place, but I love how they're trying to keep her eggs safe. I hope they survive! How funny! I've now learned way more about Killdeer from you and your readers. I hope her eggs/little birds will be safe. I must admit that the eggs are very pretty... What great pictures! We've had killdeer lay eggs in our garden beds, right on the mulch and you can barely see them. I've NEVER seen them hatch out, however. Each time an animal has gotten to the eggs before the babies are born. I swear those Killdeer are the dumbest birds ever. They always lay their eggs in our driveway. then we have to make sure we don't hit them. When I was a kid and the back roads were still graveled (not asphalt) the smaller pieces of gravel would end up along the edges and that where you could always find killdear. They would run along just in front of you (me riding a bicycle) getting you farther and fartner away from their nest in the gravel. Upon closer examination, the spotted color of their eggs blended in perfectly with the gravel along the edge of the roads. I like their songs too.